Varumba Plains was fantastic. Everything about this special safari camp was first class. 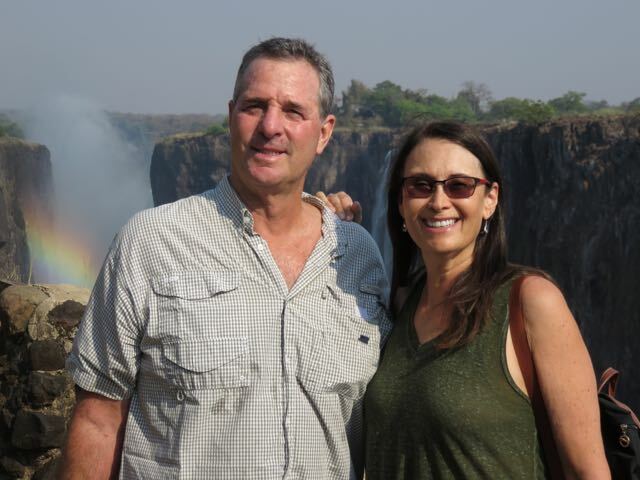 Our next stop was Livingston, Zambia and Victoria Falls. We were about to take a break from our 5:30 wakeup calls, and do a little sightseeing. Town and Country had planned a couple of full days for us, though we wouldn’t be getting up at the crack of dawn. Apparently tourists use to stay on the Zimbabwe side of the falls before Mugabe came into power. His policies and government were so corrupt he destroyed their economy. The good news was that his rule created a tourist boom for Zambia, and brought foreign investment into the country. Don’t get me wrong. 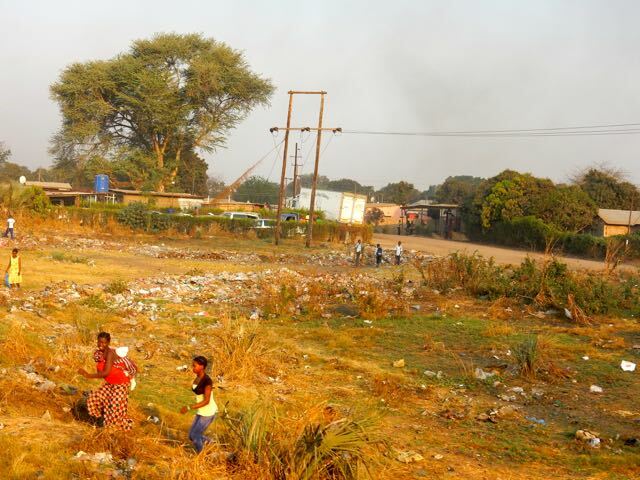 Despite the uptick in the Zambian economy this was still a very poor third world country, just not as poor as Zimbabwe. One of the interesting tourist trinkets you could buy in Livingston was a one hundred trillion dollar Zimbabwe note. At one point their currency was being devalued at four million percent per day. 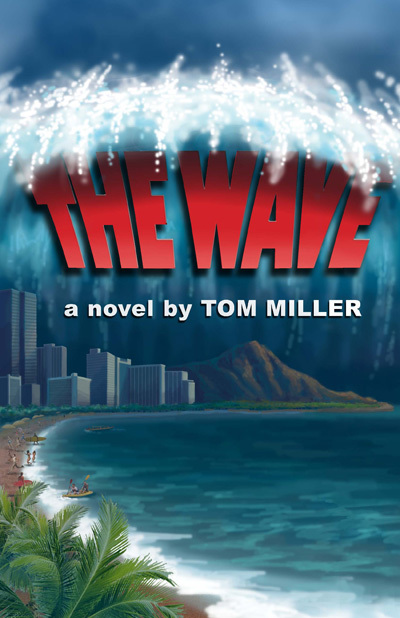 As a comparison the U.S. gross domestic product is almost eighteen trillion dollars. Our first outing was a boat ride on the Zambezi River. It was a beautiful evening, and we had the entire top deck to ourselves. Drinks and hord’overs were included. While we got to see elephants, hippopotamus and crocodiles it wasn’t nearly as exciting as our safari adventures. It was a wonderful relaxing experience. Our tour boat was a three-deck catamaran that was around eighty feet long. I had been watching the captain drive, and noted that even though the boat had three engines they didn’t respond the way I would have thought. I finally went over and asked him what kind of engines his boat had. He said, “Yamaha.” That explained everything. They were Yamaha outboard engines. There was no way their tiny propellers could transfer power to the water. It was like putting a Ferrari engine in a Mack truck. 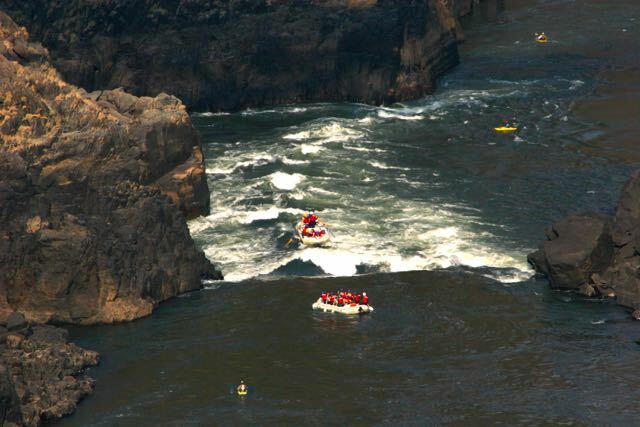 A trip down the Zambezi. 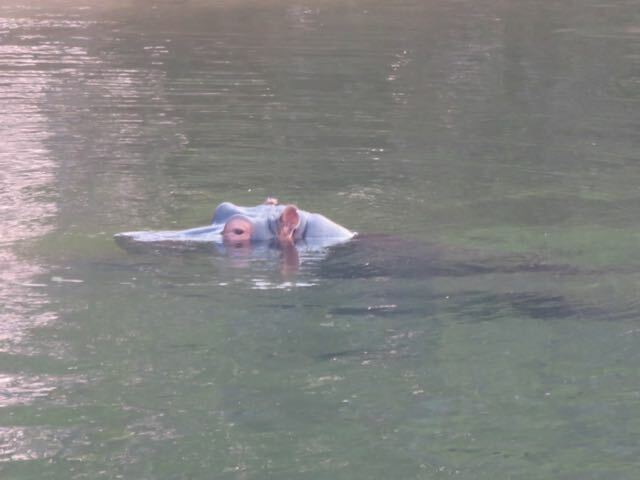 A hippo in the clear waters of the Zambezi River. 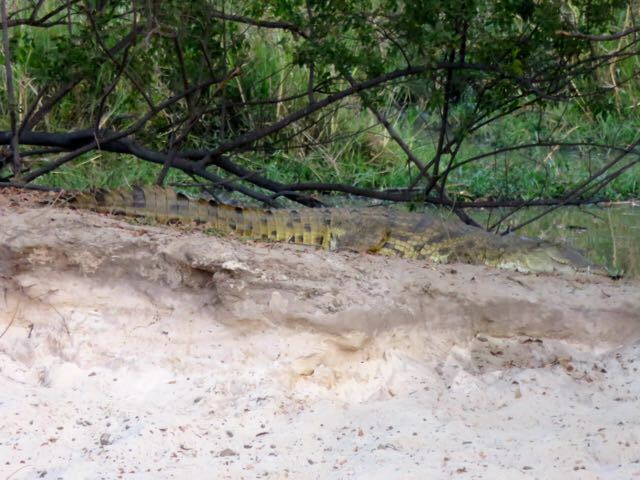 There were some big crocodiles in the Zambezi. The next day we went to the falls. 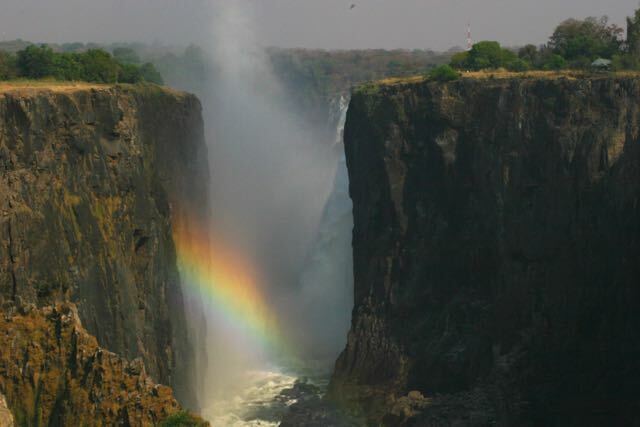 I had seen plenty of pictures of Victoria Falls, and they are spectacular. Unfortunately, when we were there the Zambezi River was the lowest anyone could remember. 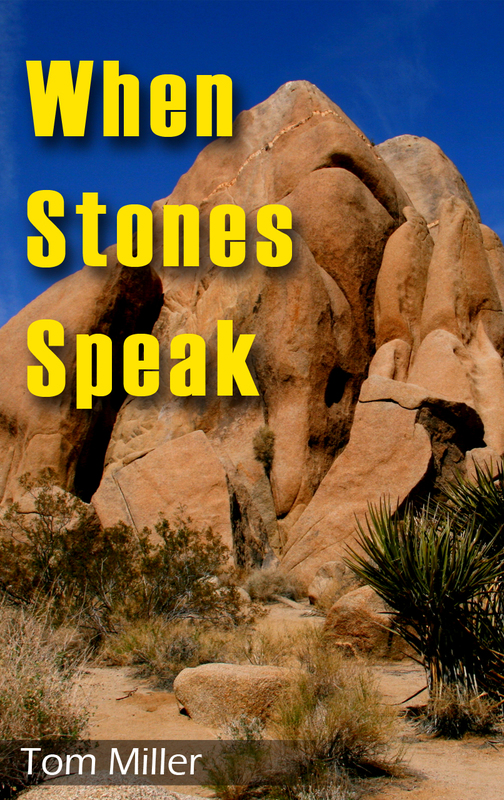 Therefore the falls were not up to their billing. Even so, they were beautiful, and I was glad we got to see them. A visit to Victoria Falls. After the falls we went to visit the Ebenezer Trust School. It is part of an orphanage sponsored by a church in the states that takes in disadvantaged children. When I say disadvantaged it’s noting like what you think of in the states. Many of these kids are HIV positive. They’ve been subjected to physical, sexual and mental abuse, and many arrive malnourished. Just seeing these beautiful children tears your heart out. That evening we went for a train ride through the African bush. It was a beautiful steam train that someone had refurbished, and the meal was surprisingly good. As the train was leaving Livingston we passed by one of the many townships. An African township is the same as our ghetto, but much worse. Many of the homes don’t have running water or a sewage system, and trash is dumped wherever it is convenient. When you see the way so many people in Africa live you realize how fortunate we are to live in the states. Someone living at our poverty level would be wealthy in Zambia. 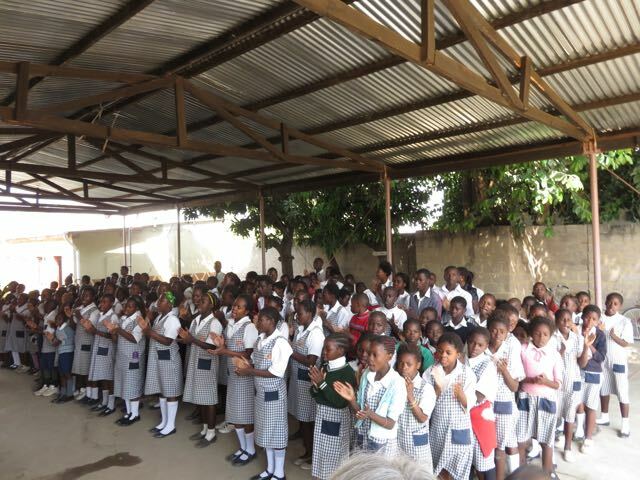 The children of the Ebenezer Trust School. 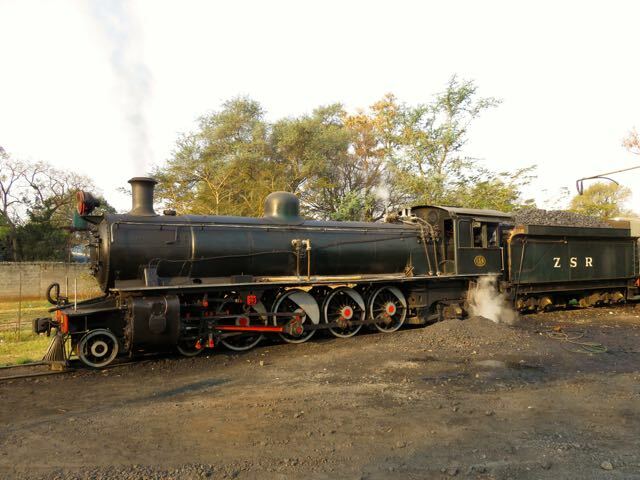 The steam engine that pulled our train. 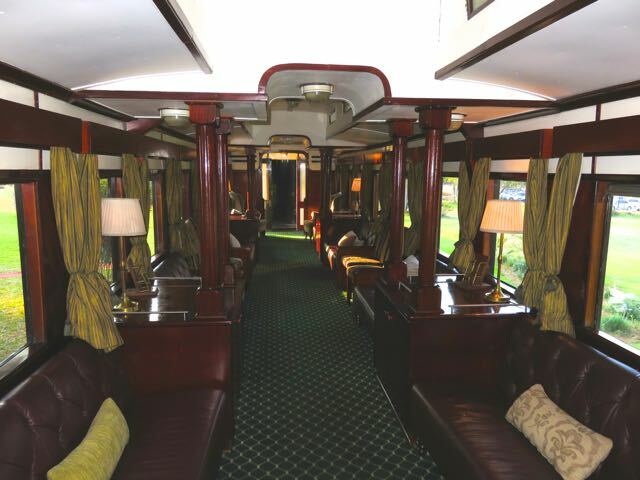 The beautifully refurbished interior of our African train. Passing one of the townships in Livingston, Zambia. 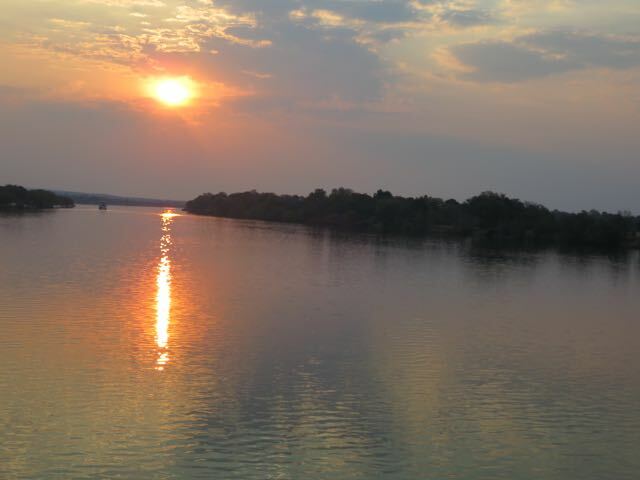 The Royal Livingston is nestled up against the banks of the Zambezi River. While its architecture may have been from the turn of the twentieth century it was only fifteen years old. What I particularly enjoyed were the wild zebras and giraffes on the property. They were not fenced off from the guests. Apparently there were some instructions in the room telling us to give the wild animals plenty of space, but I never read instructions. 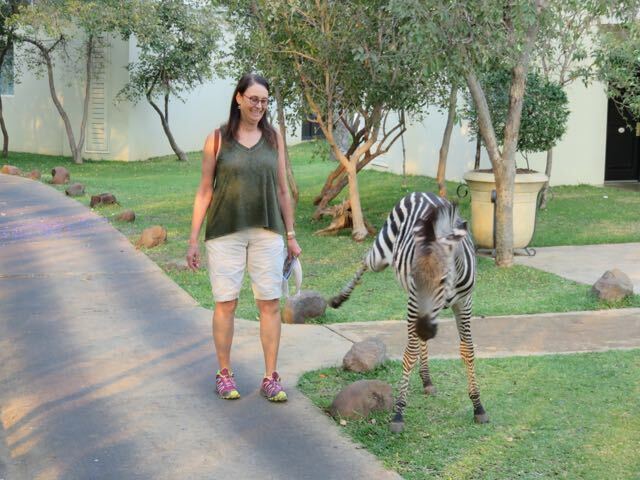 As we were walking to breakfast our last morning there were some zebras grazing on the lawn in front of our room. I told Lisa I wanted to get a picture of her next to a zebra. She complied and began to walk towards the young animal. As she got closer the zebra didn’t seem to mind, and just kept on eating. With some additional encouragement from me Lisa got almost close enough to pet the zebra. Fortunately she had the good sense to back off when the zebra tried to kick her. Lisa getting close to a zebra. 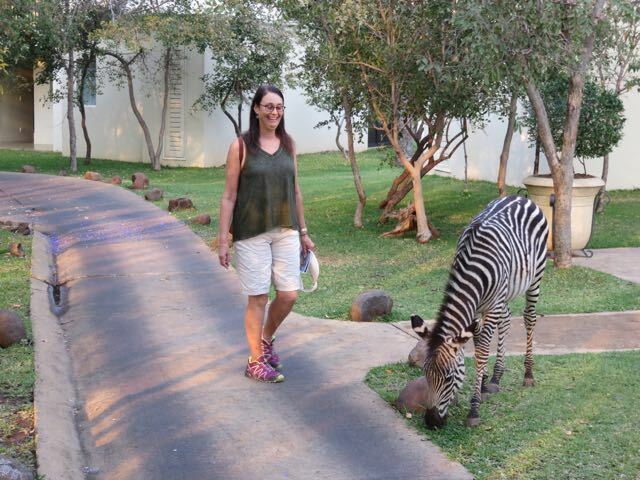 Lisa getting too close to a zebra.